We took turns holding her lifeless, precious body all night long until the sun came up. Caressing her soft skin, stroking her precious fuzzy hair, I tried to memorize every single feature of her dear little face, her dimpled little hands, chubby baby fingers, and fat little toes. Occasionally one of us would recall a funny memory and a lilt of laughter would contradict the intense sorrow that tightly encapsulated the room. “How do we walk away from here? How do we just get in our car, shut the doors and drive home with all of our stuff… and no baby,” I wondered, hours in to clutching her body tightly. Somehow she had lost her exquisitely delicious baby scent, perhaps a biological process of dying, “Maybe it left with her soul? Is that what heaven smells like?” My heart ached for that enchanted baby aroma — still does and always will. Since that morning of intense and crushing sorrow, our lives have continued on — minute by minute, hour by hour, day by day, and now year into year. 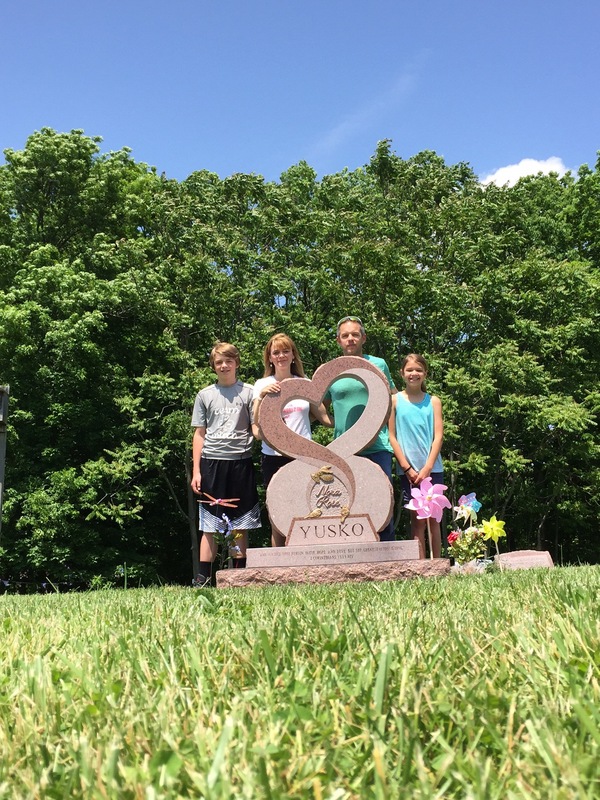 For a few days shy of two years, her little grave had been unmarked. For much of that time I was of the mindset that having “nothing” was better than settling for ordinary. We simply could not find anything that was befitting of such a special baby. About a year or so into image searching for “unique headstones” — I found one that I really liked. Indeed unique, it incorporated bronze accents into the granite. I loved that! It wasn’t EXACTLY what I wanted, but clearly who ever created that headstone had the ability to think outside the box. It was truly a work of art. I clicked on the image, ready to resign myself to the fact that they were in Europe or some far off land, as had been all the others I’d liked. Once redirected to their website, I sat staring in disbelief — Louisville, Kentucky!?!?! Really?!?! If you only knew the number of times I was redirected to a foreign website would you understand my astonishment! This is how I found Joy Monuments. Deciding on a headstone for your child is probably one of the saddest things a parent could ever have to do. But I will say that it was truly a “joy” to work with Joy Monuments. They were so patient with us as we tried to make up our minds on what it was that we truly wanted. This was nothing that we could have (or wanted to) pick out of a catalog. The portfolio of this monument company’s extraordinary work indicated to us that there wasn’t much that they weren’t capable of. So for many months we brainstormed and traded ideas back and forth until we finally settled on the perfect design, the perfect stone type and color, the perfect fonts, and the perfect accents while needing to take the cemetery regulations into consideration. We had to, of course, feature the “3 Little Birds” who showed up time and time again — before, throughout and after Nora’s life. The 3 little birds with their message pure true, as the song goes, “Don’t worry, about a thing. Cuz every little things gonna be alright.” Our pet house sparrow Ava (1997-2007) served as the model for the 3 little birds. They are created out of bronze, sculpted from pictures we provided of Ava. Each bird also represents a number 7, with there being 7 letters in ‘SPARROW’. The three of them together are the ‘777’ treasured days that Nora was here with us. 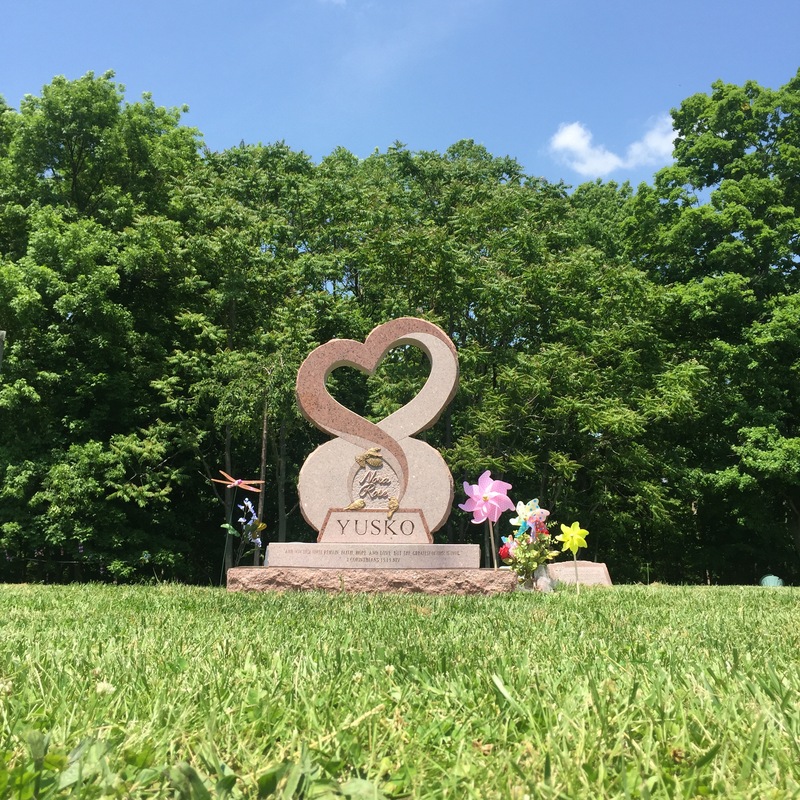 The headstone wouldn’t be complete without the asymmetrical, perfectly imperfect heart. The top of the heart is formed by a scripty letter E, for ‘Elanora’ (Nora’s full “fancy name”), E for ‘Eternity’, and E for the high-pitched ‘eeeeeeyeee’ noise that used to elicit a big smile from her sweet little face. The rest of the heart blends into the infinity symbol representing our infinite love, God’s infinite love, and the infinite eternity of heaven. In anticipation for the day when our time is up on this earth we purchased the plots on either side of Nora. Someday my name and William’s name will be placed on the base of the monument with our respective dates, as we are united together in eternity. One bird in flight (Nora) and the other two birds (her Mom & Dad) perched in waiting with their paths to Eternity clearly marked, etched in stone. Until then, I’ll be perched right here missing her, remembering her, and thinking about her and the June 3rd that she took flight. The grief is still very heavy. There are days when its weight is agonizing, but it is now just a part of me and I’ve accepted that. There is nothing I would do to be rid of it because it is all that I have left of her. It is the evidence of my love. This year, for Catholics, the feast of the Sacred Heart of Jesus falls on June 3. 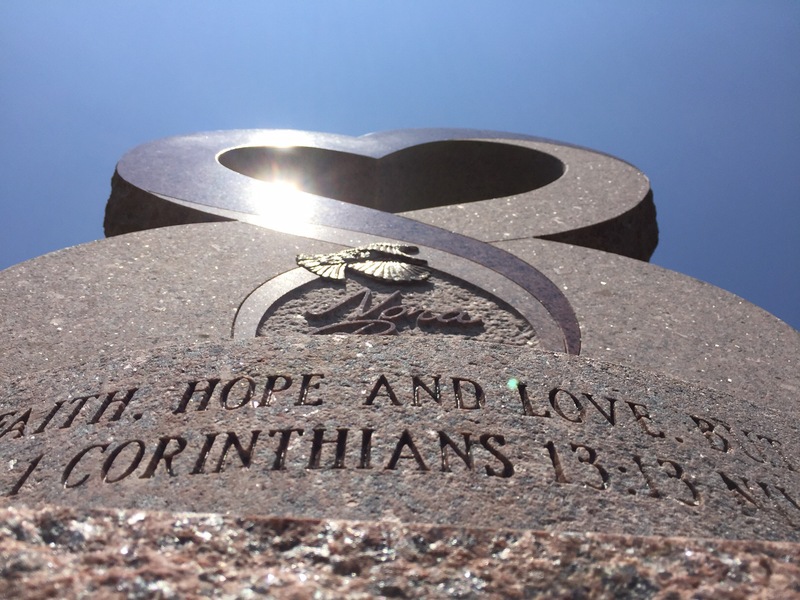 It seems quite appropriate that this devotion, which focuses on the love of Our Lord for each of us, as symbolized by his human heart, would be on Nora’s eternal birthday, right as this beautiful heart monument is placed on the site where her body awaits His coming. You’ve created a wonderful tribute to a little girl who touched so so so many people! Simply amazing, touching and fitting. I think of this little girl I never met, often. She had the absolute perfect family for her! Your words are beautiful. The heaviness in your heart will remain as a reminder of your deep love for Nora. The monument and your tribute are beyond words. You are such a special woman! Amazingly beautiful! When I go visit Kylie, I will now be able to visit Nora. Prayers and hugs for all of you. Breathing taking! Prayers for your family today! Amazing, beautifully unique just as Nora Rose is & always will be only now she is free to be exactly who God made her to be!!! Flying as high as those 3 birdies & able to do whatever she feels like doing, jumping, singing, playing with everyone but mostly praising the One who is above all others!!! And waiting patiently for the rest of us to join her. In His timing all becomes perfect!!! 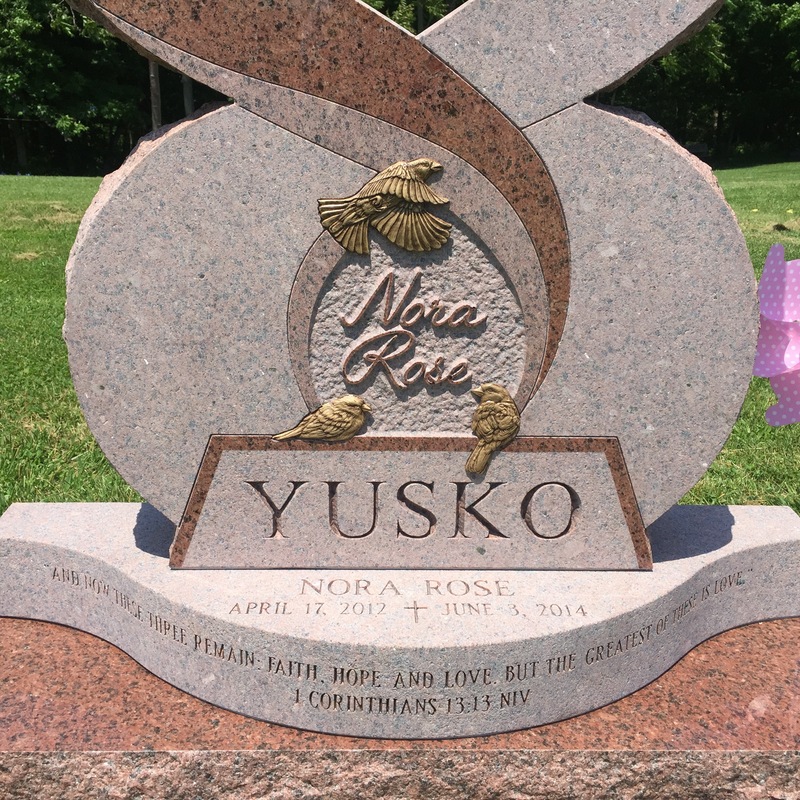 What a beautiful headstone for Nora! Nora will live in your hearts forever! You are a beautiful family and God bless you! Beautiful. The perfect tribute to precious Nora. Love and prayers to your family. We have never met but my heart is with you all. Your sweet daughters headstone is beautiful and most definitely one of a kind.it certainly stands out. I’m so happy for you that it turned out to be such a amazing outward tribute to what your sweet Nora rose meant to you.what you wanted to say to the world about her. Similar my son was in a unmarked grave After 14yrs I finally was in a position to purchased my son a headstone. It looks beautiful to most I’m sure but it was not what I had asked of the monument company. It was a truly a horrible experience.it took over a year of calls for them to even set the stone and to my disappointment it wasn’t even the stone I had signed off on. But because of this terrible experience I didn’t want to use the same Company again. I was 26 and finally had a 1 year old son who was healthy. It pulled at my heart and I felt so depressed every time I visited the cemetery. However God is Good as I am very blessed. I located a monument company that will replace the stone with one that is custom carved with something more extraordinary for my sweet Jacob. They have been compassionate and allowed me to take my time in the planning process. It’s been over three years but things are almost how I want them. Then probably another long wait to pay everything off and have it set. But that day will be wonderful.my sweet Jacob will finally have a monument befitting of his short life. The monument company agreed to refinish the stone in place now to donate to a family of a lost child.